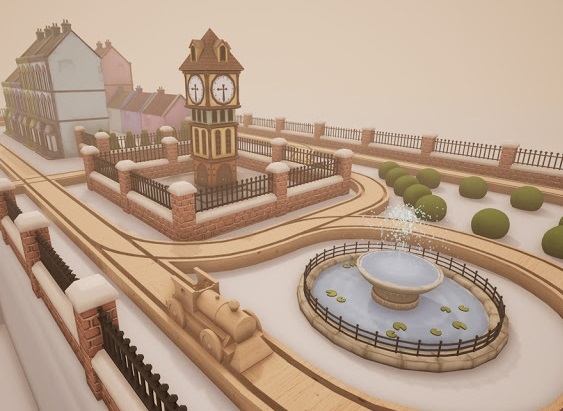 For anyone with fond childhood memories of playing with wooden train sets, Tracks: The Train Set Game offers a wonderful trip down memory lane. 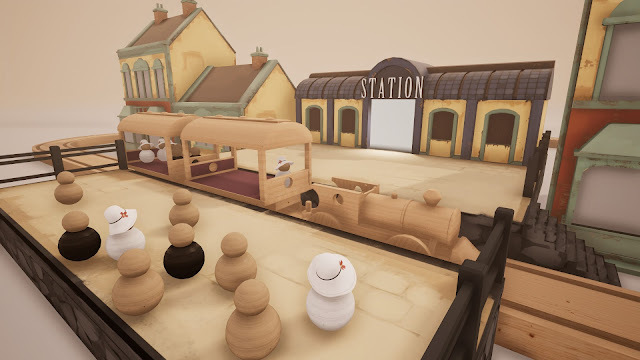 In the simplest terms, it’s a game about building railway tracks with those familiar wooden pieces, over and under and through whatever furniture is nearby, and then driving your train around to pick up and drop of spherical wooden passengers. It’s a charming, soothing experience in the same way that playing with an actual train can put your mind at ease. The difference is that, being a video game, Tracks isn’t beholden to any law of physics it doesn’t want to be beholden to. No longer do you have to worry about running out of track pieces or not having the right corner for what you’re trying to, because you have endless stock of every track type. No longer do you have to worry about the need for bridge supports or unwieldy vertical constructions, because the track’s quite good at holding itself up. No longer do you have to imagine being a train driver, because you can drive your train in first-person, like the little wooden engine driver you always wanted to be. With those few limitations removed, you can build almost any railroad you could imagine. In the current early access build, there are two different environments to build in. Firstly, there’s a sort white void, which basically works like a blank canvas—with no walls or obstacles to build around, it’s just you and your train set. The other is a modern apartment living room, with a couple of couches, a dining table, television, some chairs, and what have you. Incorporating all those different objects into your designs is a lot of fun, and really captures that feeling of being a kid playing with a train set at home. The couch becomes a station; the table becomes an overpass; the TV cabinet turns into a tunnel for the train track to weave through. The track editor works very well, intuitively altering the type of piece based on where you move the mouse. Instead of manually selecting a turn piece and then place it, simply move the mouse to the left or right, and the suggested piece will change to match; then you can drop it down and move onto the next. To add elevation, use the scroll wheel (or Q and E keys) to move the camera, and the track will follow. Link a piece of track to another, and the branches will build themselves. You can also do all this manually, by selecting a particular piece to use, but the automated system almost always gives you exactly what you need. A train set is never just about the trains; it’s about the scenery, the houses, and everything else that comes with it. Tracks is no different, giving you a good selection of different objects with which to decorate your railroad. At this stage, there isn’t a huge amount of options, but there’s enough that you can build a simple little village or scenic railway. Again, without limits on stock or where things can be placed, you have freedom to create to your heart’s content. This isn’t SimCity, but you could build a thriving metropolis with a complicated railway running through and around it. You could build a long, winding, scenic route through the mountainous terrain of an apartment. 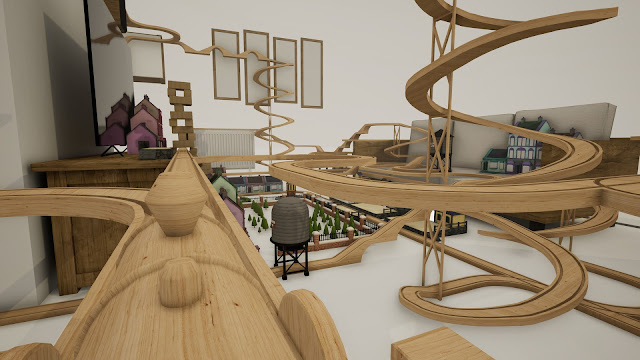 You could build a roller coaster—there’s actually a pre-made example of this readily available in the game. At any point, you switch from building mode to driving mode, giving you a first-person view from the cabin of your train and letting you drive it. A little wooden lever gives you control of the speed, and when the track branches, you choose which path to take by "turning" left or right. You can also look around, taking in the sights of the wooden world you've just built from the perspective of a tiny little wooden person. It's surprisingly awe-inspiring, putting yourself in the shoes of a toy like that. For those wanting something more objective-driven, there’s a mode that gives you a goal of getting passengers to their destinations. A platform pops up somewhere, full of passengers who are trying to get to some other platform or station, and you have to build a track to connect the two before driving the train to pick them up. Once they’re all safely dropped off at their destination, another platform with another group will pop up, and away you go. There are also “business passengers”, who are in a hurry (they’re very busy people, you see), so when they pop up you get a time limit. There doesn’t seem to be any sort of punishment for not transporting them in time—other than your own innate sense of failure, but maybe that’s just me—but I imagine this will change as the game grows and adds modes with a win condition. I’m really looking forward to seeing how Tracks develops. The developers are planning to add new environments, objects, train customisation options, and game modes, as well as Steam Workshop integration so that people can share their creations. I can’t wait to try them all out, but en at this early stage, with its two levels and small handful of objects, Tracks is a delight to play. It’s a relaxing, soothing, peaceful game, and for anyone who grew up playing with those wooden train sets, it’s a lovely nostalgia trip as well.